So, what do you like in your taco? Ground beef? Beans? Lettuce? Shredded cheese? What about fettucine alfredo? Or maybe fried chicken? I am always down for new dining experiences and fresh concepts. 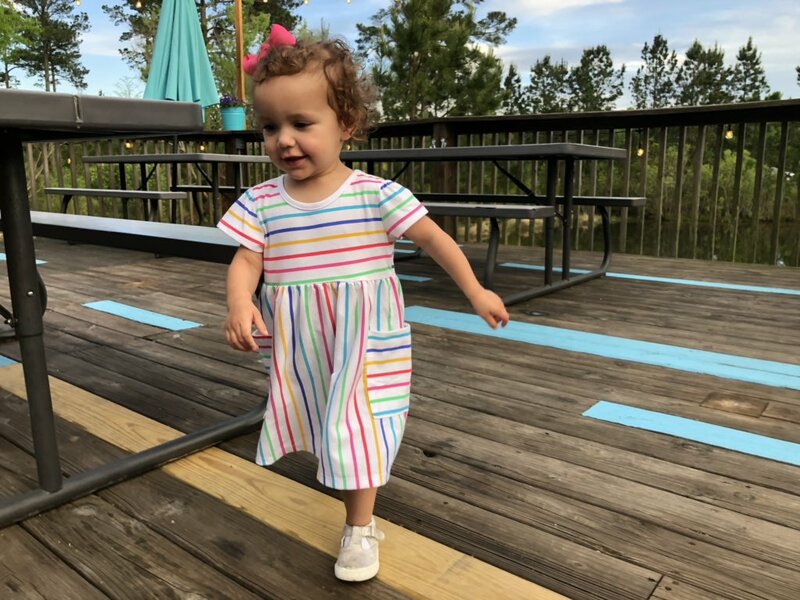 This past weekend, our family of three went to one of Myrtle Beach’s newest restaurants, the Sneaky Beagle. 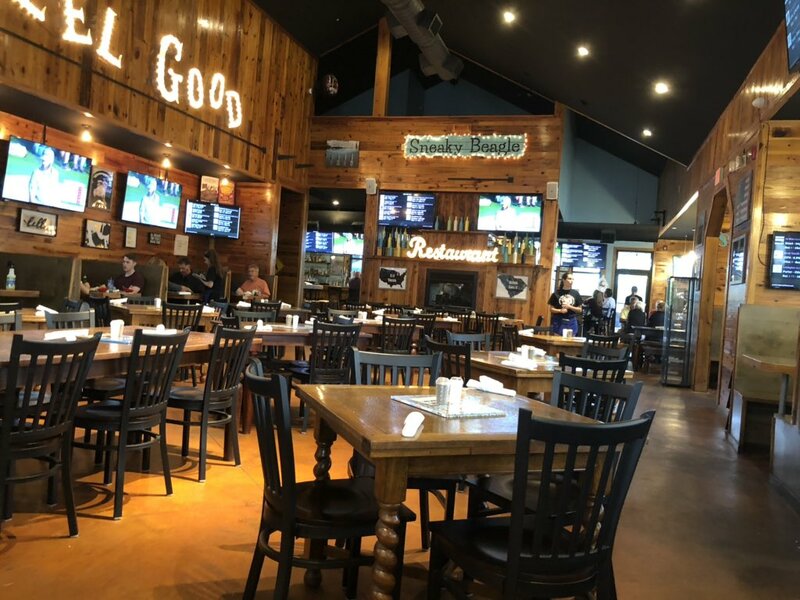 Located in the former Longbeards building on Carolina Forest Blvd., I enjoyed checking out the reincarnation of a former restaurant I once enjoyed. The outside of The Sneaky Beagle. The Sneaky Beagle did a great job of cleaning house. Even though I enjoyed the atmosphere of Longbeards, the new occupants gave it a makeover, one that fits the brand of the Grumpy Monk, the flagship eatery of the restaurant umbrella under which the Beagle resides. But this post isn’t meant to evaluate the aesthetics of the Sneaky Beagle, nor is it to review the restaurant as a whole. Basically, I just want to shed light on the eccentricity of the place ¬– but even I want to compartmentalize that as well. My intention is to focus on the food, specifically the tacos. Even so, I have to quickly mention a big drawing point of the Sneaky Beagle. This post isn’t to evaluate the aesthetics of The Sneaky Beagle, but it is nice inside. As its name suggests, the Sneaky Beagle is a dog-friendly restaurant. There is an entire menu dedicated to canines and from what I saw on Saturday night, four-legged creatures are coming in droves. There is a large patio and deck area for the dogs to dine with their owners, but the inside is off limits to the animals – something I appreciate or otherwise I probably would not have been a customer. Remember, I am a cat person. I promise the patio was full. The deck, where you see Sloan running on, was half full (I made her run in the area that wasn’t full). Until a few days ago, I had never seen anything like it. As I looked over the menu that specialized in non-Mexican tacos, I smiled at the creativity and boldness of what was available. Taking the only thing that draws influence from a traditional taco, a tortilla shell, customers are able to choose from 15 different fillings. Some of these fillings are very American, some are quite funky, and some are a little shocking. But they are all original and (for the most part) intriguing. In addition to the ones I named above, here are some of the other options: chicken waffle, tequila-lime, buffalo chicken, coconut shrimp, mushroom, and Caribbean pork. Which ones did Sidney and I choose? None of the above! But before I tell you what we ordered, let me explain the combinations. Customers can choose to order 1 taco/1 side ($5.99), 2 tacos/1 side ($9.99), or 3 tacos/1 side ($13.99). Sides include sweet rice, fries, garlic roasted potatoes, candied cream corn, or side salad. 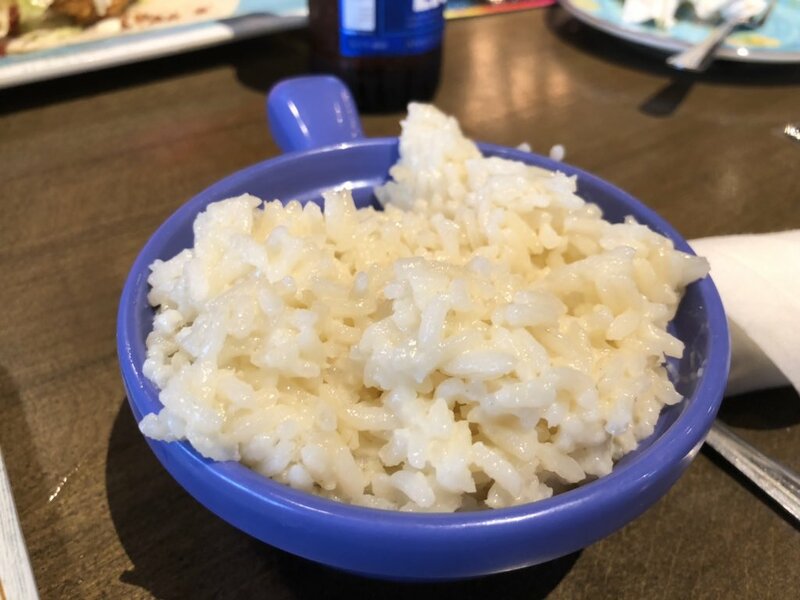 I am keeping the tacos I ate a secret until the next paragraph, but I will reveal my side…I had the sweet rice. Sidney and I each ordered the 2 tacos/1 side option. 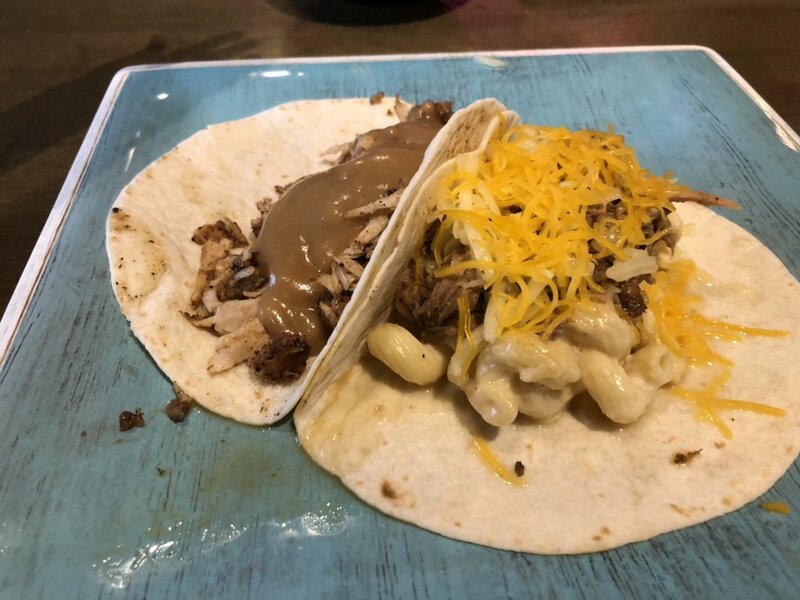 I chose the Thanksgiving day taco (oven roasted turkey, stuffing, gravy) and the mac and cheese taco (pulled pork, mac and cheese, pepper jack cheese, shredded cheese) with sweet rice. 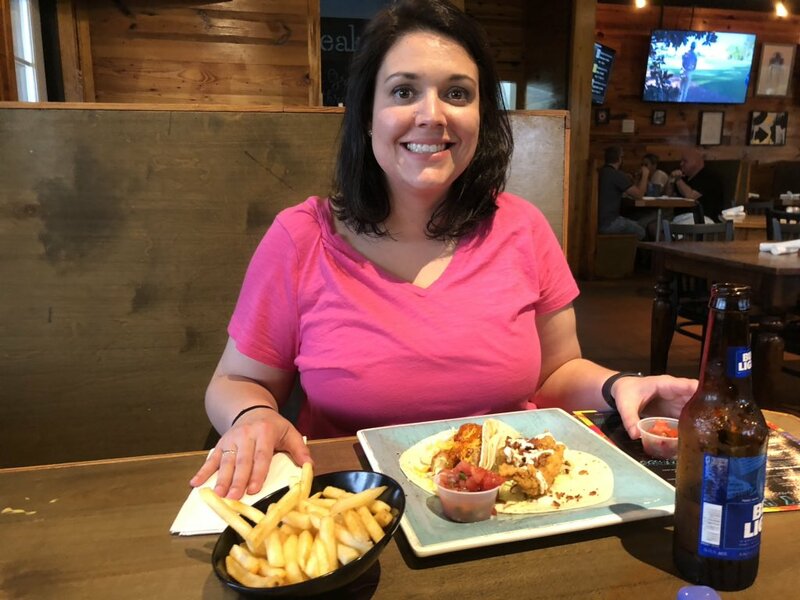 Sid opted for the Sneaky taco (hand battered and lightly fried shrimp, Sneaky sauce, lettuce, cheddar, pico de gallo) and the CBR Taco (fried chicken, bacon bits, ranch, lettuce, pico de gallo) with fries. The Thanksgiving day taco tasted just like Thanksgiving dinner inside a shell. The contents spilled out a bit but it was warm, flavorful, and comforting! The mac and cheese taco actually tasted like something I would eat in the South. The texture was more natural than the Thanksgiving day taco and it was more heavy too. I had a slight concern that I might be still hungry after eating just two tacos but that fear was unfounded. I was stuffed silly. Perhaps the rice put me over the top? It was excellent and had a very unique, but mild, taste. I had the Thanksgiving day and mac and cheese tacos. I can’t report on the quality of Sid’s tacos because I didn’t try them–not because my wife wouldn’t give me a bite–but because I don’t care for a couple of the ingredients in both of her tacos. But you can take her word for it when she told me that both were delicious. A look at Sid with her tacos and fries. 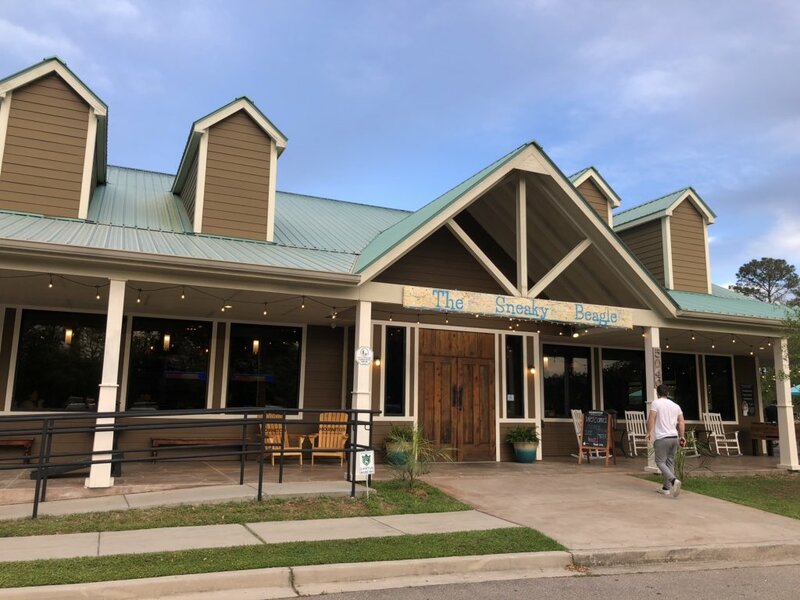 If you live in Myrtle Beach and are looking to try a new restaurant that offers a menu/concept a little out of the norm, give the Sneaky Beagle a try. Woof Woof! Don’t Blink.